Stacy Tilton Reviews: Indoors or outdoors, it's time to relax! Indoors or outdoors, it's time to relax! Whether your the indoors type or one of those people that likes to get outside as much as possible there's always a way to get some relaxation in. For my daughter it's laying on her new giant pelican in our backyard pool. I was really in shock at just how big the pelican float was when fully aired up. I knew it said giant in the description, but had no idea! We actually love it being so big though. It's a nice place to stop and sit if you want to be up and out of the pool for awhile. As you can see it's quite large, my daughter is 11 and had a ton of extra room so it could easily hold two people no problem. When it's not being used we actually use a bungee strap to keep the pelican from drifting around the pool or blowing out. It's much easier than trying to take it out of the pool and store it every time we aren't using it. Recently it even made it trough a pretty big rain storm with no problems so I'm very impressed with it. The PVC material it's made from is good and thick so I honestly don't worry about leaving it outside in the pool like I do some of our smaller floats. I would highly recommended using an electric air pump if you have one otherwise it will take quite some time to blow it up. I do like that there is more than one place to air it up also so if one happens to come open by accident you don't deflate your entire float. You can press them down into the float like most inflatables so this shouldn't be an issue. My daughter didn't realize this though and kept snagging one of the plugs open and letting air out before I showed her it pushed down into the float. 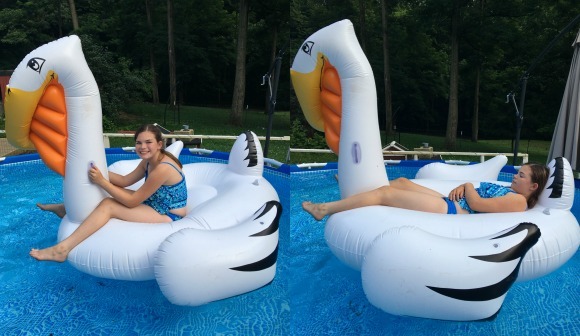 • Giant pool floatie perfect for use in the pool, at the lake, or even in the ocean! • Made with a strong and durable PVC material to last for years to come. • Large enough to fit 2 adults at a time. • Easy inflation of less than 10 minutes. But if you're not into hanging out in the heat (like me) than you'll probably enjoy this plush futon instead. I got this for our family/game room because the kids like to have friends stay over and they don't really have a place to sleep at our house otherwise. Both kids have small twin beds and our main couch is only a love seat. With this futon we have a place for them to sit and play games, and then it can be folded down flat to use as a bed for their guests. And the matching pillows are an added bonus in my book! I'm one of those people that likes things to match so this was exciting for me. The futon is super soft to the touch and the plush material makes it very comfortable to lay on. Both of my kids have actually slept on this just for fun because they thought it was so soft. It's super easy to change the position of the futon from upright, to reclining, to folding it down flat. I like that it has a split middle so you can even lay down half if you like. This is nice for our pup to be able to lay down on one side comfortably while one of the kids sits upright beside her. • Plush futon made with versatile split-back design. • Guaranteed comfort as the result of its tufted plush linen fabric upholstery and hypoallergenic filling. • Split-back feature can accommodate two lounge preferences at once, as one half can recline into a flat position while the other remains up. • Available in a variety of colors, allowing you to select it in a shade that perfectly complements your living space’s setup. 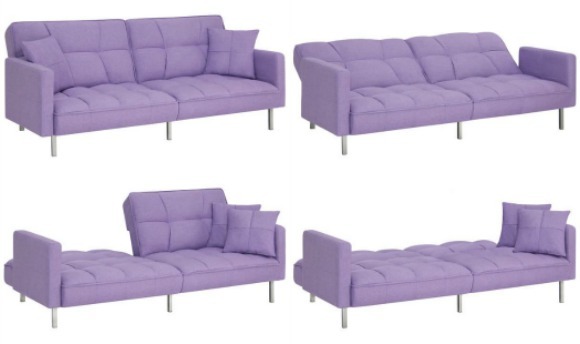 • Couch Dimensions: 75.5"(L) x 28.25"(W) x 33"(H); Bed Dimensions: 75.5"(L) x 43"(W) x 23"(H); • Weight Capacity: 500 lbs.